To avoid personal injury (including death) or property damage, read and understand this entire section before installing your gas connector. Follow all instructions and safety precautions during installation, use and maintenance. If you do not understand any of these instructions or precautions, call a licensed gas fitter. Warning- To prevent corrosion, DO NOT allow strong cleaning solutions or chemicals to come in contact with the connector. These include acids, solvent solder fluxes with zinc chlorides, ammonia, chlorinated chemicals, and any liquid with chlorine such as laundry bleach or dish detergent. An accessible manual gas shut-off valve must be installed on the gas supply ahead of the connector. DO NOT proceed with this installation if a shut-off valve is not installed - call a licensed gas fitter for assistance. Caution- DO NOT assemble the connector nut directly to male pipe threads. DO NOT install the gas connector so that connector so that it is concealed within or runs through any wall, floor or other partition. The gas outlet must be in the same room as the appliance (range, dryer, space heater, water heater, etc.). The connector should be of adequate length to reach from the gas supply line to the appliance without stretching. NEVER join two or more connectors to make a longer connector. Flex connectors meet national building codes and the ANSI standard for gas connectors (ANSI Z21.24). However, local codes and regulations prevail. Some jurisdictions require the use of pipe thread sealant rather than Teflon® tape. Contact your local municipality to verify applicable codes. NEVER reuse a gas connector. If a new appliance is purchased or an existing appliance is moved, a new connector must be used. Only the fittings supplied with this connector or those manufactured and recommended by the appliance manufacture should be used. Connectors are designed for occasional movement after installation. Not for use with castered equipment. Repeated bending, flexing or extreme vibration will cause metal fatigue and must be avoided. Normal operation of a clothes dryer, infrared tube heater or similar appliance does not constitute extreme vibration or movement. The flexible gas connector is to be used on natural or LP/propane gas supply systems having operating pressures no higher than ½ lb. Per square inch. DO NOT kink, twist or bend the connector smaller than 1½" internal diameter (approximately the diameter of a golf ball). Avoid sharp bends - no right angles. AVOID contact of the connector with foreign objects such as wall studs, electrical wiring, copper or iron pipe, paneling, sheet metal, etc. to avoid corrosion. DO NOT use the gas connector or gas supply line for the appliance ground. Flare: tapered (beveled) surface of connector nut or fitting where the seal occurs. Pipe thread sealant or a flare surface. Male tapped female: all male connector fittings are threaded internally to also function as a female fitting one thread size smaller. Shut off the gas with the shut-off valve near the appliance on the gas supply line. If a shut-off valve is not installed at the appliance, it is recommended that you consult a licensed gas fitter for proper installation before completing connector installation. A shut-off valve is not included with a flex connector. Remove existing/old/connector and fittings (if present) from the gas supply and appliance. Uncoil new connector. This makes the installation easier and helps avoid twisting or kinking of the connector. Clean the gas supply pipe or valve with a soft-bristle (I.e. scrub brush) to remove any debris. Selecting fittings by testing the fittings on both the gas supply line and appliance line prior to proceeding. If installing an appliance kit, it contains fittings to accommodate most standard applications. Remove fittings and set aside. WARNING - Do not use pipe thread sealant or Teflon® tape on any flare ends because you will not obtain a leak-free seal. Keep flare end of fitting and flare seat of connector nut free of grease, oil, pipe thread sealant and Teflon® tape. -Use a wrench only on the hex surfaces of the fittings. 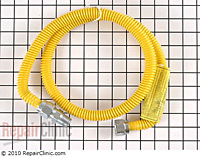 -Never loosen a connection after tightening-this may cause a leak. It is always better to tighten more if a leak is detected. If fittings is installed improperly, remove fitting, reapply pipe thread sealant or Teflon® tape and reinstall properly per instructions. -Do not use a pipe wrench or channel lock pliers on the connector flare nut. The nut can be damaged or you will not achieve sufficient tightening torque which will cause a leak. Use open-end or adjustable wrenches only. Prepare the gas supply line. Choose scenario a or b. 1. Open the pipe thread container. Hold the fitting in your hand, with the flare end in your hand. Apply a liberal amount of pipe thread sealant to the first half of the male pipe threads, starting at the opening of the fitting. Smooth with finger or small brush (if using your finger, make sure to wipe so you don't get thread sealant on the flared threads.). If using Teflon® tape, hold fitting as above - apply the tape in a clockwise direction starting at the opening of the fitting, wrap 3 or 4 times, snap in the same direction as wound and smooth the end. 11. Attach the fitting onto the valve. Tighten by hand as tightly as possible. 111. Tighten the fitting. Hold the gas supply line tight with a pipe wrench. Hold the fitting with an adjustable or open-end wrench. Stabilize the gas line with a counter-clockwise grip. Tighten the fitting by using a clockwise grip. Do not over-tighten so as to strip the threads. 1. Connect the connector flare nut directly to the valve without a fitting. Do not use pipe thread sealant or Teflon® tape on the flare of the valve. Prepare the appliance side. Choose scenario a or b. 1. Hold the fitting in your hand, with the flare in your hand and apply pipe thread sealant ( or Teflon® tape) to the male pipe threads. 1. Apply pipe thread sealant (or Teflon® tape) to the male pipe threads of the appliance stub-out. Attach the fitting onto the appliance connection. Tighten by hand as tightly as possible. Tighten the fitting. Hold the appliance connection tight with a pipe wrench. Hold the fitting with an adjustable wrench. Stabilize the appliance connection with a counter-clockwise grip. Tighten the fitting by using a clockwise grip. Do not over-tighten so as to strip the threads. Connect the connector to the gas supply side. To simplify installation, the end of the connector should be straight (a bend in the neck makes tightening difficult). WARNING- DO NOT kink, twist, or bend the connector smaller than 1½" internal diameter (approximately the diameter of a golf ball). Avoid sharp-no right angles. b) Hold the fitting in position with one adjustable or open-end wrench. Hold the connector flare nut with another adjustable or open-end wrench. Stabilize the fitting with a counter-clockwise grip. Tighten the connector nut with a clockwise grip. Connect the connector to the appliance side. To simplify installation, the end of the connector should be straight (a bend in the neck makes tightening difficult). a) Tighten by hand as tightly as possible. 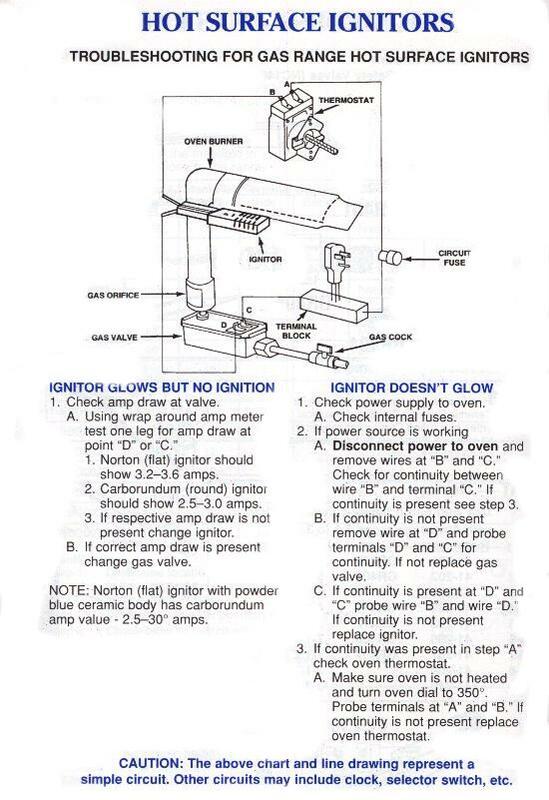 WARNING- Matches, candles open flame or other sources of ignition should not be used for leak testing. CAUTION- It is recommended that leak testing be done using non-corrosive gas leak detection fluid (such as Big Bubbles gas leak ). Dish washing detergent, bath soap or other house hold chemicals that contain chlorides should not be used. Open your leak test solution. Apply enough solution to each threaded joint (including the connector) so that it covers the entire circumference of the joint. Hold a towel or rag under the joint to catch any spill-over. If there are any leaks, bubbling will appear at the joints. Use a small mirror to view obscured areas. a) If a leak is detected, tighten the connection and retest. b) Never loosen the connection. If leak is not remedied by tightening, remove fitting, reapply pipe thread sealant or Teflon® tape, reinstall and reset. c) If the leak is still not remedied or if the odor of gas is detected, turn off gas to the appliance and have an gas fitter or appliance tech correct the problem. Some leak detection solutions may cause corrosion. After testing, thoroughly rinse all joints with water and dry. WARNING - If you smell gas, turn off the gas at the main valve and call an gas fitter or local gas company to test for any leaks and fix any problems.